The first performance of Circus Ethiopia in Addis Ababa in1991 had a basic simple technique set up; a few ropes were put, a cassette player was powered from a car cigarette lighter and on went the show the audience comprise of some 700 or so children from the neighbourhood. Each week, this number increased and today there are often between 3000 and 5000 people attending the shows for free. The Circuses performs usually on a weekly basis in different venues. Circus Ethiopia or Circus In Ethiopia? Today, four circuses are part of an Association called «Circus in Ethiopia» : Circus Ethiopia ( the original group), Circus Jimma, Circus Tigray, Circus Nazareth). 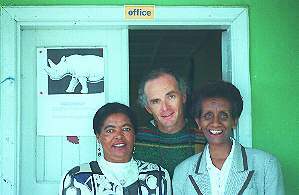 On the international scene these groups travel under one name: "Circus Ethiopia". The benefits from the international tours are reserved for the establishment of homebases in the four respective cities where the circuses are based. Wherever the company performs in other cities, it inspires other groups to follow the same example there are already six such groups all over the country. Associated to the movement, they take as a model the four maincircuses. Their aim is also promote the Circus in Ethiopia objectives in collaboration with the local communities, the Red Cross Branches and with local organisations. The Association provides these new groups with training workshops in circus and administration skills and whenever possible basic materials. For the circus movement to develop it needs to remain independent as an organisation and to continue serving the hopes of children. The circus groups, which have been working together since 1991 have become almost a family. None of their members can imagine life without circus any more. The children come from a variety of background:some were born into ordinary Ethiopians families, others live in very poor conditions some even in the streets. The performance group: this group performs usually every week free of charge in open spaces for the community; during the school holidays it tours other regions of Ethiopia. The performance groups also tours internationally. The 160 boys and girls, in Addis Ababa, Jimma, Mekele, and Nazareth, aged between 8 and 21 years, permanent members of the performing troupes are all encouraged to follow their regular schooling and attend as well tutorial classes provided by the circus. Most come from extremely poor backgrounds: they receive a transport allowance, their medical needs are covered and meals are offered after long practices and shows.The members come from different background and religious groups. Most of them have been with the Circus right from the start.Accommodation is also provided when needed near the Circus Compound.The circus schools are taught by these youngsters which provides an income for them. As well, within the administration structure the older youths have also been trained and hired to support the functioning of the organization. In fact, the main idea for the organization is to provide a platform for the future of these young performers: in giving support for their formal education, by providing training opportunities for securing a future for themselves. The Circus Schools are composed of children from the community who train in all circus skills. Their teachers are members from the performance group.An important circus concept is that young people should train young people.The Circus school gives occasional performances to the community and some pupils have become members of the performance group.Training usually takes place three times a week. Students pay a 10 Birr fee a month ( U$1.50). The Street Kids Program: homeless and working youngsters are part of this project. They rehearse three times a week. Their trainers are members of the performance group. Children part of this program receive a meal at the end of every practice and receive transport money. One of the aims of the Street Children Program is to help them to put on a show o their own which can be perform outside in the street. This helps them to earn a bit of money and to replace begging with a more useful activity. A circus movement for the youth: Today the four main circuses are well established with the support of their communities and humanitarian organizations. They perform usually every Sunday to three to five thousand people a spectacle of circus, music and heath advocacy in stadiums and open fields around the country. In 1997 it is estimated that 700,000 people attended a circus performance in Ethiopia. Through years of development the circus performances have now become original productions with traditional costumes, music, and dance representing the rich cultural legacy of Ethiopia. The circus acts, which were at first influenced by western ideas are now inspired from traditional Ethiopian dances and movements. The original group in Addis Ababa has started what can be called a youth movement within and outside Ethiopia. nine other cities have started their own circuses in the same style. It is difficult to know how many youths practice circus in Ethiopia. In 1997 the first Ethiopian circus festival regrouping the 6 largest circuses was held in Jimma. The week long event was attended by more than 60,000 people in Jimma. This important event has crystallized the circus movement for years to come. 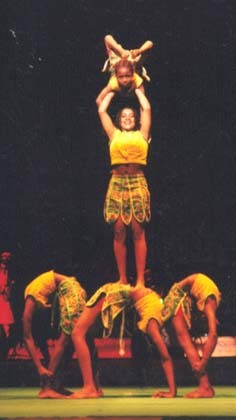 The second Ethiopian circus festival should be held in February 1999. In Somaliland and Eritrea circuses have already been established in the last years in cooperation with Circus Ethiopia. Discussions are ongoing to support the establishment of the circus concept in other countries in East and West Africa. Today, more than 50 people are employed by the Circus across the country. The activities of the Association are directed by a Board of Directors composed of Founding Members and the Directors of the four main circuses. "The most important thing we are aiming at is to build our own circus centers where we can live and work, where different ideas and the energies of different people come together. Like a symbol, we want to show our culture. We do not want to copy European culture; our ideals are not the Eastern circuses or the North American circuses. We have a strong identity of our own. With the help of the circus we want to show our culture to other countries. But to achieve this we must live together. We are getting land in the four cities where the circuses are established and with the help of the international tours revenues and friendly organizations we are planning to to establish the circus movement in a permanent way. Within these centers we also want to establish training facilities for many different jobs for our youths". Circus Ethiopia has also attracted the interest of artist from abroad. «Cirque du Soleil» from Canada, European groups such has «Les Cousins» and «Oposito» for Rhinocéros 98 (France), «Labyrinth» (Germany), Circus Rodjeknor ( Netherlands) which supports them with ideas, equipment and money.